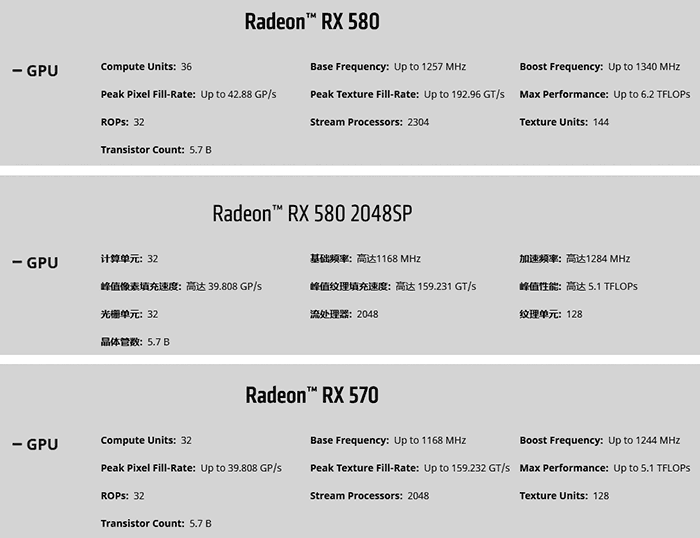 AMD's Chinese website has listed a new graphics card SKU dubbed the Radeon RX 580 2048SP. If you head over to the linked page you will find it listed directly beneath the Radeon RX 580 in the lower third of the page. For further comparison here is a link to the US product page for the RX 580. Below you will find a montage of the Radeon RX 580 and RX 580 2048SP key specifications, and the RX 570. If you pick through the specs charts above you can see the relationships between these three SKUs. Considering the AMD-chosen key specs, the Radeon RX 580 2048SP is a lot closer a relation to the RX 570 than the RX 580. The sole advantage the Radeon RX 580 2048SP seems to have over the RX 570 is an extra 40MHz of boost frequency. However, compared with the RX 580 there are many more differences. AMD does highlight the SP count difference in the naming of the new SKU but perhaps it hasn't called this right, even calling it something like a RX 575 would be pushing the lines of acceptability. Afterall, some people might buy this expecting the performance to be nearer to the RX 580 than the RX 570. We haven't seen an AMD Radeon RX 580 2048SP here in the west but you can find one listed in China, at online retailer JD.com. 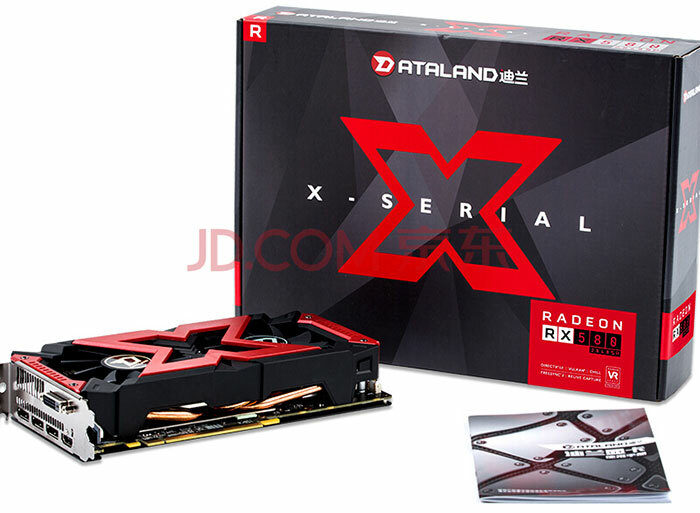 The Dataland RX580 4G 2048SP X-Serial is listed on this site for ¥1349.00 which is a little under £150 at today's exchange rates. Last December AMD confused customers with the release of Radeon RX 560 graphics cards with 896 SPs, alongside others with 1024 SPs. Experienced PC parts buyers will check and enquire about these kinds of specs when not advertised but others might not get what they had expected. tbf the entire 500 series should've been called the 4x5 series, per AMD's own description of their naming scheme. But then the naming scheme didn't even last one generation (cf no suffixes v RX 470D in China). That said, this is a relatively bog-standard move for the Chinese market. It may even have been one of the OEMs selling into China that asked to do this, rather than it being an AMD-driven initiative. Ngh, they're all at it. See, you're saying its just a 570 but i see this as a cut down 580 for the chinese internet cafe market.